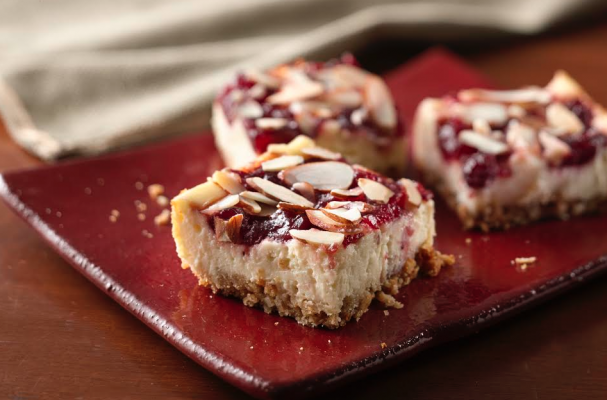 Cranberry almond cheesecake squares is an easy dessert recipe. Instead of a traditional graham cracker crust, this cheesecake has a sweet and salty granola crust. Also, this recipe substitutes full fat cream cheese with a mixture of reduced fat cream cheese and Greek yogurt. You still end up with a silky and rich cheesecake but with half the calories, each serving is only 110 calories. Heat oven to 350°F. In food processor, place granola. Cover; process, using quick on-and-off motions, until finely ground. Place in small bowl. Stir in 3 tablespoons sugar and the melted butter until well combined. Press mixture in bottom of ungreased 9-inch square pan. Bake 8 minutes. Meanwhile, in large bowl, beat cream cheese, yogurt, sugar, flour, almond extract and eggs with electric mixer on medium speed until smooth. Carefully spread Cheesecake Filling on top of crust. Drop Cranberry Layer by spoonfuls on top of Cheesecake Filling. Top with almonds. Bake 40 minutes or until lightly browned around edges and center is set. Cool 30 minutes. Refrigerate about 2 hours or until chilled.